The U.S. Navy has a new laser weapon that it is deploying in the Persian Gulf. 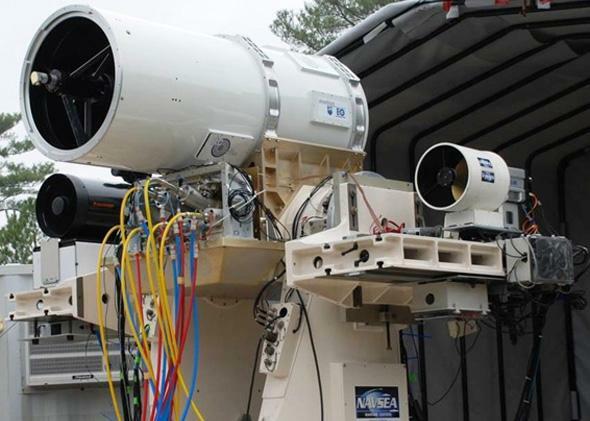 A Laser Weapon System prototype during a test in May. In science fiction the future is always packed with lasers. Think tractor beams, high-energy prison bars, and weapons. But we 2014-ers have some cool laser stuff, too! They’re in our Blu-ray players, our medical breakthroughs, and now our defense systems. That’s because the U.S. Navy has deployed a laser weapon that it’s been working on for years. As Bloomberg reports, the USS Ponce has been equipped with a 30-kilowatt-class Laser Weapon System since August for its patrols around the Persian Gulf. The weapon faces the bow and fires everything from warnings, which emit a bright flash, to damage shots that can set a small boat or drone on fire. A Congressional Research Service report explains that the laser comes from combining the beams of six solid-state commercial welding lasers. The Navy says that firing it costs about $1 per shot. The laser weapon has been in development since 2007 by Naval Sea Systems Command, and the prototyping process cost $40 million. Fifth Fleet spokesman Commander Kevin Stephens told Bloomberg that the laser weapons passed a number of at-sea tests before being deployed. One example might be testing and creating protocols for avoiding blinding people with the laser. Per the 1980 Convention on Certain Conventional Weapons, laser weapons can’t be used in combat for the sole purpose of blinding, but they can be used for other purposes if the operator takes precautions to avoid blinding others. Accidental blindness in spite of an effort to avoid it is apparently excusable. The Navy will continue testing the laser weapon for a year and will then decide how it wants to refine or change it. With its different intensity settings it sounds kind of like a Star Trek phaser, but Laser Weapon Systems are now very real.